The world's greatest free throw shooter Fred Newman setting a World Record by making 209 three pointers in a row. Fred Newman is in the documentary "Quantum Hoops" about the Caltech basketball team and their record 21 year losing streak. This is not an actual scene from the movie. This is an edited version of tape he sent to Guiness to become the world record holder. The actual tape has no cuts and is 45 minutes long. "Quantum Hoops" is now available on DVD! 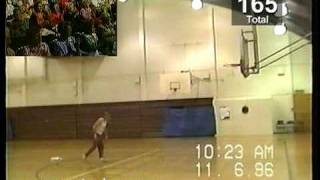 Jul 11, 2008 · I this real World Record 209 three pointers in a row by 60 year old man? Have you ever seen a 7'9" guy play ball? I have!